HomeAll classesCraftsTerrariumTerrarium Masterclass - Bible Factory Studio! Our terrarium studio welcomes you to join the Botanical Boys at their private Warehouse Studio tucked inside a peaceful factory development in Dalston for this mindful, relaxing workshop. 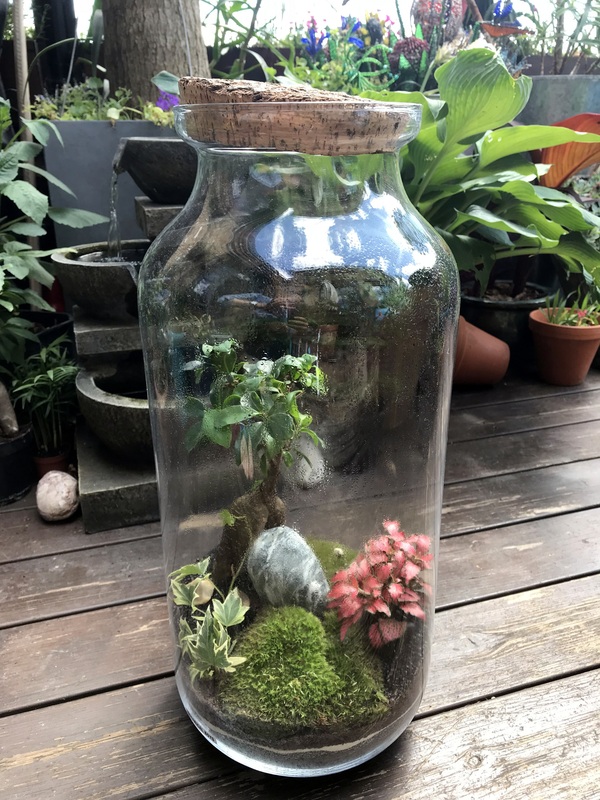 You get to build a self-sustaining living garden in a 3 ltr glass jar topped with a natural cork lid to take home with you for displaying in your interior. Once built, your garden will look after itself and we will teach you all the necessary steps whilst listening to some cool music beats and sipping on some of our Prosecco and Teas. It's a miniature environment of living plants that thrive off moisture. You will learn the whys and how's for making a self contained living botanical environment. We look forward to hosting you in our green studio and provide you and your friends with a mindful and creative event. 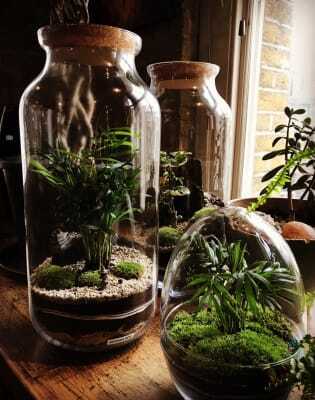 Did you know, that by making a terrarium you will be helping to save a piece of Mother Nature. Such a great way to spend a cold winter’s evening! The Botancial boys were perfect hosts and very knowledgable. Lots of great materials were made available and the prosecco was the perfect touch! Will definitely be signing up again! I can't recommend this class enough. I'm a big obby fan and I have been to some great classes, but this has by far been my favourite experience. My sister and I were lucky enough to be the only ones in our session, and Darren and Ben made us feel so welcome in their studio. Darren's excellent reaching gave us the perfect amount of knowledge to confidently build a really unique terrarium each. There was a huge variety of materials for us to work with and we were told all about the fascinating history of the art of terrarium making. The prosecco was also a wonderful touch! The Eco-system jar we came away with was absolutely beautiful, I've already received so many compliments on it. Will definitely be creating some more! Thank you Botanical Boys! A wonderful relaxing afternoon with the botanical boys! Would highly recommend. Amazing workshop in a gorgeous setting. I had so much fun whilst learning loads about plants and drinking prosecco....what’s not to LOVE! would throughly recommend this class to anyone. So excited to have a self sufficient jar of nature coming home to live with me for years to come! Had a thoroughly good time. Really liked that once you were taught the basics and shown what to do, the guys gave you plenty of time to do your own thing. Also amazing that a room of strangers felt like friends by the time I left. The class is very relaxing and the host very interesting. Our terrarium are now sitting proudly in our living room and we can't wait to have guests to show off a bit! Darren and Ben were great. We loved the history lesson and the teaching. Taking home our terrarium we had huge smiles on our faces. Thanks Botanical boys! I was happy with the terrarium we created during the workshop, and overall it was a good experience. I would have liked things to kick off a bit more quickly, though, with less of an introduction of the history of the workshop/brand, and also had a bit more conversation at the end about other techniques for making terrariums/materials and ideas for doing them at home. Lovely class, lovely people! The perfect way to spent a slightly fragile Sunday. Great evening. Really interesting to hear about the history and theory behind terrariums, and so much fun creating our own. They’re in pride of place at home now. Darren and Ben were super helpful and friendly! Great class, insightful - the guys provided interesting history and tips. Fun to experiment with different materials and build something you can keep and watch grow As recommendation I think the particular space (a one off) didn’t work and will definitly do another class with them at their own studio. Also it would be good to show different types of gardens you can make/ emulate as inspiration. Overall highly recommend though and I’ll be coming back! A fantastic and well run workshop! The Botanical Boys run the workshop in a fun and informative way and were very hospitable and friendly. Highly recommended! I absolutely loved this workshop - the hosts were very welcoming and I had a glass of prosecco by my side mere minutes after walking through the door - and the teacher was extremely engaging and informative. 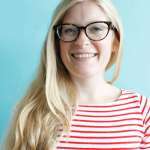 I learned more than I had expected to, and the friendly and relaxed atmosphere meant that I got chatting to people around me, so despite coming alone, it was nice and sociable. Super fun, and I love my terrarium! I made 3 more for Christmas presents! Was such a great day thankyou! Wonderful experience. Great teachers, lovely space, very pleased with our creations! Absolutely loved the finished product, great to come away with something you've made yourself and to get creative! It’s not every class that lets you create your very own world! I loved every second of this class. Darren and Ben were very welcoming and told us just enough about the history of terrariums and gave lots of inspiration on how to create our own. My jar is thriving and I’ve been telling everyone how much I loved this. I gave this to someone as a Christmas present and had a great time making two lovely Terrariums. It was very informational but also relaxing and we were very well received by the Botanical Boys, I would definitely recommend this. Really fun afternoon and a bautiful terrarium to take home! Absolutely amazing evening! The guys were so informative, fun and friendly and let us bombard them with plant related questions. Have recommended this workshop to everyone who will listen to me!!! Really fun class and good selection of materials! This was such an educational and therapeutic session. I learnt so much and it was such a relaxed atmosphere creating, planting and sipping prosecco! Can’t wait to do another! This workshop was wonderful. The boys are very welcoming and the class itself is both informative and enjoyable. The quality of the materials provided was also very good. We found the experience incredibly relaxing and loved having our terrariums to take home at the end of it. Thoroughly recommend. Amazing! I had a really good time and left with a beautiful terrarium. Defiantly worth a visit. SO MUCH FUN! This was our first obby experience and what a great one it was - it was informative, friendly, fun, and we came away with sonething which will hopefully last a good long time. Just the two of us in the class, and Darren and Ben were fab. Loved it and would fully recommend - even my boyfriend, who is not normally the creative type, said it was the best Friday night he’d had in years! The Terrarium making class was excellent. Darren and Ben were great fun and we really learnt a lot. I would highly recommend the class to anyone, and the product we came away with looks great in our home. The terrariums workshop was really enjoyable. Darren gave us a lot of information about the history and the techniques around terrariums. The space was beautiful and the atmosphere was very pleasant. Would recommend to anyone wanting to disconnect from the rush of everyday life! I could not have picked a better class as my first Obby booking. Darren and Ben are exceptional; so friendly, welcoming and knowledgeable. The entire experience was fun, educational, relaxing, artistic, creative; we loved every second of it! Highly, highly recommended; I'm telling everyone about it! What a fantastic way to spend a few hours. The Botanical Boys were excellent hosts welcoming us into their home. Some people may feel uncomfortable with this but for us this made the experience more personal and relaxed . Being in a small group meant that there was great opportunity for interaction between the boys and guests. It was educational, fun and very therapeutic and best of all we came away with our own terrarium creations. No previous experience or creative talent required just go with the flow. This was booked as a birthday surprise. I’m definitely going again with my friends as my enthusing has been contagious. I highly recommend the Botanical Boys experience. We had a magnificent time at the workshop. I was really worried that I wouldn't be any "good", but we were led through the process and came away with terrariums that we love. Very therapeutic! I can thoroughly recommend this workshop - the venue is amazing (what décor!) and you are offered so much help and guidance to make a beautiful terrarium. The time was very calm and relaxing - I left feeling very zen! I really enjoyed the workshop. It was two hours of inner stillness, creativity, life and also great pieces of information regarding Terrariums. Loved it. Darren and Ben were so friendly and welcoming into their beautifully decorated flat in east London. Darren was so knowledgeable and extremely patient when guiding us through the steps. I am not typically a creative person but I found it really inspiring and actually left with a terrarium I was proud of. Would strongly recommend going as it really was a relaxing and enjoyable couple of hours with endless glasses of prosecco and a terrarium that you get to take home, what more could you want!! Darren was a gorgeous host with lot of experience! I can absolutely recommend this course to everybody who is interested in plants and terrarium! Very professional course in a lovely location. Loved that we learnt some history and background to terrarium making and that little skill is needed to achieve something. I’m inspired to keep doing it and will 100% recommend the class to others + it’s perfect for a corporate activity. Really great class! We had a really great time at this class. Ben and Darren were lovely and made the experience fantastic - great hosts and lots of knowledge. I would definitely recommend doing this class and will be booking again! Great session! Going again for sure! Darren & Ben were the perfect hosts, teachers - they have a beautiful studio/home. The class was chilled, educational and the perfect birthday present for my best friend. The quality of the plants, materials + teaching, the amazing terrarium vase you take home with you was way beyond expectations! Great workshop! So much fun, ended up with a fab terrarium to take home and learned a lot too. We've tried other workshops were everything is very 'measured' - it says's one glass of prosecco, so you get one glass, class finishing on the exact time. But here class overran by 45 minutes because everyone were having so much fun and wanted to take photos etc in the end, everyone got several fill ups on prosecco, no limit on how many plants or items you wanted in your terrarium. Ben and Darren knows a lot about plants, have a lovely home/studio and created a really friendly and relaxed atmosphere. Would highly recommend the Botanical Boys to anyone who wants to try something new! This class was great, amazing setting to hold such a creative workshop and am delighted with my new terrarium! Super workshop in a cool studio. Botanical Boys are friendly and great teachers. Learnt a lot, and had a lovely gift to take home. Incredible evening making terrariums, full of laughs and insights and couldn't be happier. Don't miss out! Such a great atmosphere and wonderful hosts. Really happy with my terrarium and to be able to bring it home with me. I loved this class, it was so much fun. We learnt about the history of terraniums and how to make the base layers. Thereafter we had the freedom to make our design using a number of materials supplied that we could choose from. I highly recommend this class! Excellent workshop! Great materials provided - especially liked the glass terrarium. Really fun and informative workshop - The Botanical Boys are really friendly! This was an amazing night. I went with my partner and it was great to be creative and relaxed! I am excited to give out terrarium's as Christmas gifts- and I am hoping my partner books us in for another class so I can have one too! Brilliant experience within a very personal setting, suitable for the class. Thank you for the education and history lesson as well : ) I will denitley be recommending and also be back! What a great workshop! Filled with so much knowledge, history, tips and tricks. Absolutely love the take-home terrarium - can't wait to show it off. Thank you Darren and Ben! The class was brilliant in a beautiful location. I really enjoyed putting together my terrarium (and enjoying a glass of fizz) and it now has pride of place in my living room! Thank you! A nice way to be in touch with nature in the middle of your busy city day. 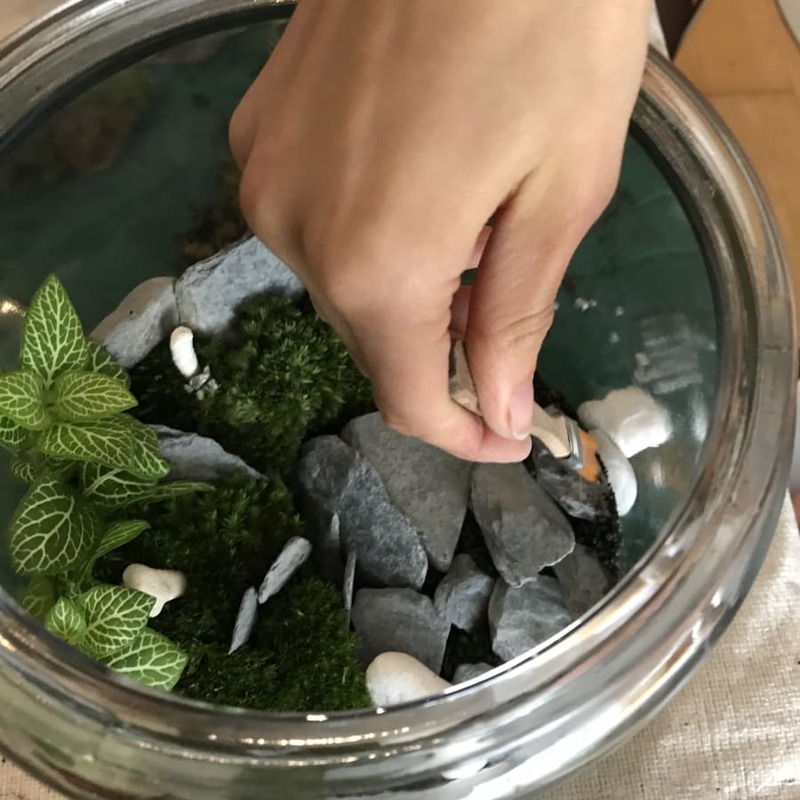 Really enjoy making my own terrarium while learning about the history and tips to take care of it. The studio is amazing - surrounded by plants and terrariums, you would forget that you're in London! I’ve never made a terrarium before but I’ve always admired them. Creating one with the botanical boys was the most relaxing and therapeutic thing I’ve ever done. The environment and the music along with the tea & Prosecco really added to the whole experience and made it feel magical. I highly recommend this workshop. You won’t regret it. Ben and Darren were both fantastic! A wonderful, fun and relaxing class in their beautiful home. Will be strongly recommending to everyone I know, it was so much better than I could have ever expected and my Mother had the best birthday gift experience! Thank you Botanical Boys! I was part of a group of three that attended the masterclass as part of my friend's birthday. We had such an amazing time - the class was informative, fun, hands on and exciting! I really liked how the designs were freeform - it was good to create something unique, rather than follow a template, so I felt like I truly created something for myself. It was a great class and I really enjoyed making my own terrarium. I would only suggest to look at lighting of the studio as was a bit dark for me everything else was fantastic. A five star experience!!! I had an afternoon right out of the top drawer. Thank you Botanical Boys ! Really great workshop and a perfect way to spend a Sunday! Fantastic way to spend a few hours! Set in a lush oasis in East London! Very relaxing and creative experience. Highly enjoyable and would definitely recommend! So so pleased with finished product. I had a fantastic class with Darren who was an excellent teacher and explained so much about terrariums (including the history, the various components etc). He was patient and funny, and I really enjoyed the class. The studio is so gorgeous with many other terrariums (I ended up asking to buy one of them and took it home with me!!!). He also very helpfully explained in great detail every part of my terrarium and the proper aftercare. I’ll be spreading the word about this class to everyone. Highly recommend. We really enjoyed this class! It was a peaceful way to spend an evening and the Terrariums we produced were lovely to take home. A lovely afternoon and the outcome was definitely worth it, have already recommended to friends. Botanical Boys was the perfect Sunday afternoon activity! We had a great time and the instructors were very friendly! Botanical Boys. From the moment we walked in the guys were extremely welcoming. We booked the master class, 2 hour session. We had a brief history of how terrariums started which was extremely interesting. With prosecco in one hand and mud in the other, it wasn't your average Saturday but connected us with nature and gardening on a small scale. I can't recommend this enough, i just want to keep making them. Really relaxing couple of hours. Learnt a lot about terrariums and their history, and ended up with some great terrariums to bring home. Would recommend! Good fun, and came home with a lovely terrarium. Ben and Daz of The Botanical Boys began their journey in 2009 when they took over a terraced garden in London Fields with a Japanese & formal English segments. Having no gardening experience prior, they really got stuck in and become members of the National Garden Scheme and opened up the space to the public for charity every year. They were selected for a spot on the BBC Great British Garden Revival program in May 2015 and were featured in a number of books and publications. After a few assignments and holiday trips to South Africa and California it was succulents and their ability to be used in many structural forms, as with their sculpted Japanese and formal topiary English garden that led to a passion for creating designs on a smaller scale using air plants, cacti, succulents and a range of mosses creating beautiful terrariums. 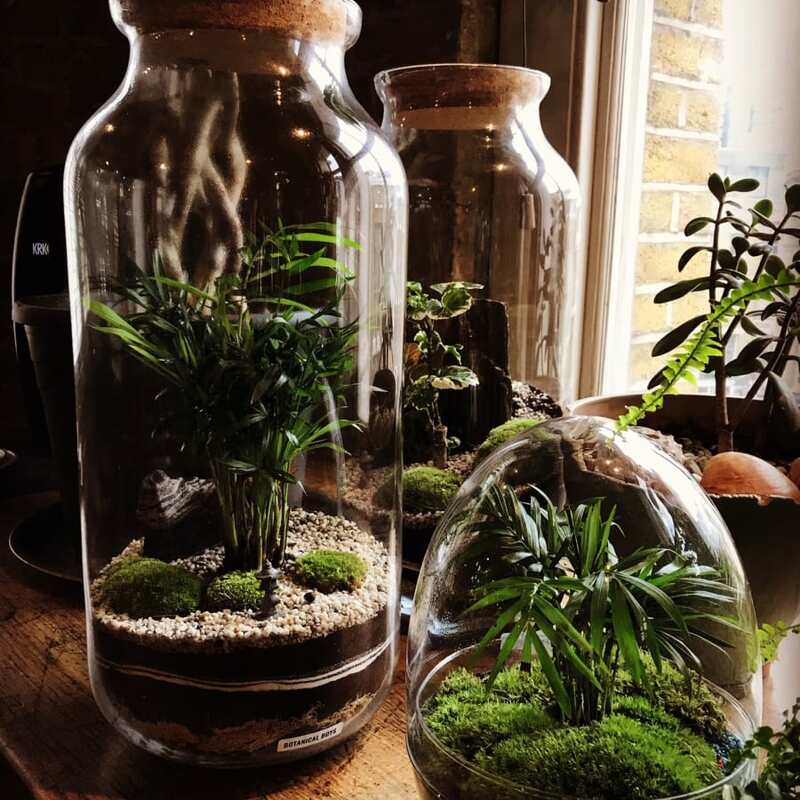 Their love for plants and terrariums is infectious and people who join them on their workshops not only make a beautiful terrarium, but are taught about all the natural elements involved as well as provided aftercare instruction. We provide hot and cold drinks throughout your class as well as a gift bag, plants, glass vases, education on making a terrarium and of course, lot's of fun and relaxation.